Tanja St. on her Friesian Anja: "When I saw him the first time and sat in it, I was thrilled ..."
"Since March 2015 I can name a black Dressage Andaluz with Montana embossing my own. I ride mainly dressage on the course and although the Dressage Andaluz is actually a dressage saddle, horseback riding is a lot of fun and I have never been able to complain about pain because of long sitting in the saddle. So it is also suitable for long rides! When it was clear that a new saddle had to and my saddler had the Iberosättel again in the assortment, I wanted to try one. Have me already in the design and also the great edition for horses "verguckt" and thus it was clear, it must be an Iberosattel. When I first saw him and sat in it, I was thrilled. Also the quality is great and from the design is much possible. There is something for everyone. I like it rather simply and therefore I have decided for the Montana embossing, which looks really great. 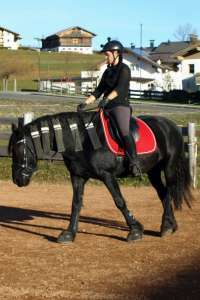 The saddle is very comfortable to sit and also my Friesian loves him. With him she snorts soon after the ascent, gives after a short time the back and this has also changed again to the positive, since I have my Dressage Andaluz. For the cold months I have additionally a lambskin cover and can only recommend this. Even at very low temperatures it is warm and can give the aids targeted, without being rigid from cold. What I like in addition, the pips can be exchanged with this model. From the service I can only say positive. Even on questions about Facebook was answered within a very short time and also helped."